January is ticking right along. How are you doing on your resolutions and intentions for the New Year? One of my goals for the month, based on my budget and the idea of simplifying, is using up ingredients in my pantry and freezer. Food waste is something I can't stand, so when a friend of mine shared the 2018 Pantry Challenge from a vlogger she likes we jumped on board. Our Pantry Granola Bar "recipe" made 22 crunchy, lightly sweet granola bars. If you think about the cost of many granola bars at the store, this saves quite a bit of money, and you are cleaning out your pantry and preventing food waste. Things to consider including, flax, chia, any nuts you have, dried berries or fruit, quinoa, oats or other grains you can eat dry; for the liquid a variety of syrups, nut butters, coconut oil, etc, will work. I still have chia seeds and cacao nibs left, so I will share our next creation in another post. Slice into granola bar size and put into containers, so you can grab and go. 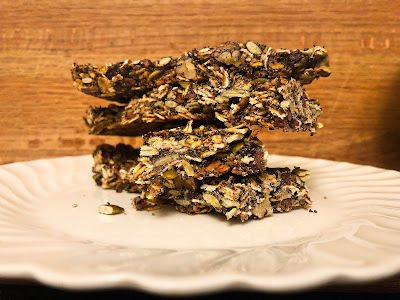 You can google granola bar recipes, many of them are no bake (who knew), if you need more definitive ratios and instructions, but I say, get creative and trust your gut.